I eat this soup when my tummy is upset. You can make a spicier version of this by doubling the dried herbs & spices. In 1 quart saucepan saute the onions, carrots and celery stalks in the olive oil til golden, keep stirring them to get them all a little browned. Add the broth, the bay leaves and the herbs and spices. Remove bay leaves but do not discard them yet. I use a handmixer to puree the soup to a nice smooth consistency. You don’t have to puree it, but I do when I’m healing from an upset tummy. Add the bay leaves back in. Cut the bottom 2″ off the asparagus and discard, then and dice the asparagus finely and add it in. Simmer another 25 minutes. 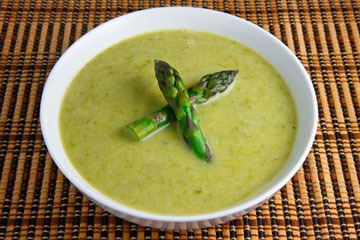 This soup has good natural flavor and is so healing to the body. This entry was posted in Uncategorized on October 18, 2015 by goddess.